Einstein claimed that his Special Theory of Relativity and its theoretical and mathematical consequences were supported, confirmed and empirically verified by experience and experiments. But when analyzed and scrutinized in light of the foregoing chapters, it turns out that none of these attempted confirmations of Special Relativity have any empirical validity. where i is the index of refraction of the medium and v is the velocity of light in a vacuum. However, in the material media of air, water, glass, and diamond, the increasing density of particles of matter tend to progressively slow a light ray down and change its direction of propagation in accordance with Snell’s “Index of Refraction.” The general conclusion (which results from these facts) is that the speed of light only depends upon the medium through which it propagates; nothing more. For these reasons, Einstein was left to his own imagination to figure out how to determine the velocity of light at c in a vacuum from Hertz’s misleading electromagnetic equations. Einstein was only taught mechanics in his German schools; not electromagnetics. In mechanics, the velocity of anything was always determined with respect to an arbitrarily chosen “body of reference” moving at v.
The words “Maxwell’s electrodynamics” referred to Hertz’s Maxwell’s equations. Such equations contained the factor c (the speed of light in a vacuum) and they were written with respect to the mythical substance of aether, which was theoretically stationary. When the speed of light at c was applied to material bodies moving at v, the very natural algebraic result was always c – v or c + v, depending upon the direction of the body of reference. These paradoxical results of c – v and c + v were what Einstein referred to as “asymmetries” because they were not inherent in Hertz’s Maxwell’s equations. Einstein and the scientific community were baffled by this algebraic paradox. How could Maxwell’s velocity c mysteriously change from c to c – v or c + v? Whenever Einstein referred to velocity cin his 1905 Special theory he was always referring to Hertz’s incorrect version of Maxwell’s 1865 equations. In Sections 6, 8, and 9 of his 1905 Special Theory, Einstein even specifically described the equations which he was using as the Maxwell-Hertz equations for empty space (i.e. a vacuum). One might ask, what does mechanics (with its coordinates, mathematics, transformation equations, inertial principle of relativity, and a “body of reference”) have to do with Maxwell’s 1865 theory for the velocity of light in the medium of a vacuum? The answer (of course) is: nothing! They all were only false premises for any velocity of light. “The special theory of relativity has crystallized out from the Maxwell-Lorentz theory of electromagnetic phenomena. Thus all facts of experience which support the electromagnetic theory also support the theory of relativity. These statements are, on their face, hyperbole, incorrect, inaccurate and very misleading with respect to the velocity of light and relativity for many reasons. First of all, there is no such thing as the Maxwell-Lorentz theory of the velocity of light. Maxwell’s 1862 and 1865 theories for the velocity of light at c in a vacuum are contained in his Scientific Papers, which were published in two volumes in 1890 by Dover Publications. Maxwell also wrote a summary treatise of his theories for the velocity of light in 1873. These theories preceded and stand completely apart from anything that Lorentz wrote. Lorentz’s 1892 electromagnetic equations were merely a version of Hertz’s 1890 equations which Hertz invented. They have almost nothing to do with Maxwell’s 1865 theory for the velocity of light at c in a vacuum. 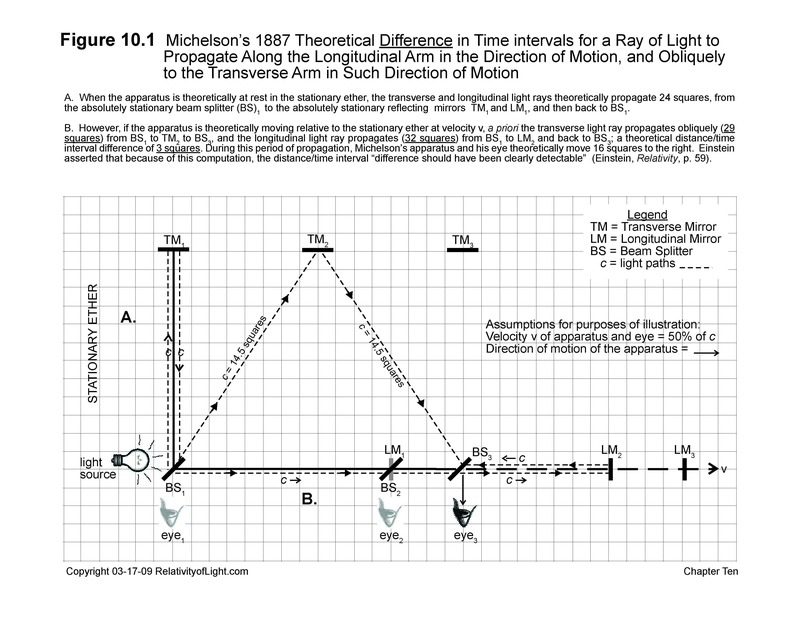 Lorentz’s 1895 and 1904 theories primarily deal with the ether drag experiments of Michelson and others as they relate to electrons and the measurements of time and space with transformation equations. The only theory of Maxwell which Lorentz even mentions in these treatises was Maxwell’s incorrect ether theory that moving mirrors displace from the stationary ether in Maxwell’s 1879 letter (Chapter 9A). Lorentz’s other connection with Maxwell was that, after Hertz misdescribed Maxwell’s electromagnetic equations in 1890, Lorentz in 1892 separated Hertz’s equations into two parts: one part applied to electricity and the other part applied to light. Throughout the period 1892 through 1904, Lorentz wrote extensively on the subject of electromagnetism and the electrodynamics of moving bodies. However, all of Lorentz’s writings, theories and transformations during this period left Maxwell’s original theories for the velocity of light completely intact. The fact that some of Lorentz’s theories and equations referred to or were based upon Maxwell’s theories and equations, and that they had something to do with electromagnetism and light, does not make Lorentz a co-discoverer of the basic electromagnetic principles along with Faraday and Maxwell. Thus, “the experimental arguments in favor of the Maxwell-[Faraday theories and equations are not] at the same time arguments in favor of the theory of relativity,” as Einstein would have us believe. Nor does it follow that all facts of experience and experimental arguments that support Faraday’s and Maxwell’s fundamental electromagnetic principles, also supports every later theory which refers to such fundamental principles, such as Special Relativity. Einstein’s only concept which even remotely crystallized out of Maxwell’s theories and equations was the first part of Einstein’s second postulate, which in effect states that light propagates over changing distance/time intervals at the absolutely constant velocity of c toward material bodies, regardless of their linear motions. But this postulate was radically different than Maxwell’s 1865 concept: the constant transmission velocity of light at crelative to its medium of a vacuum (Preamble and Chapters 6A & 21). The net result is that no facts which support Maxwell’s theories of the velocity of light also support Einstein’s invalid Special Theory, its postulates or its theoretical consequences. 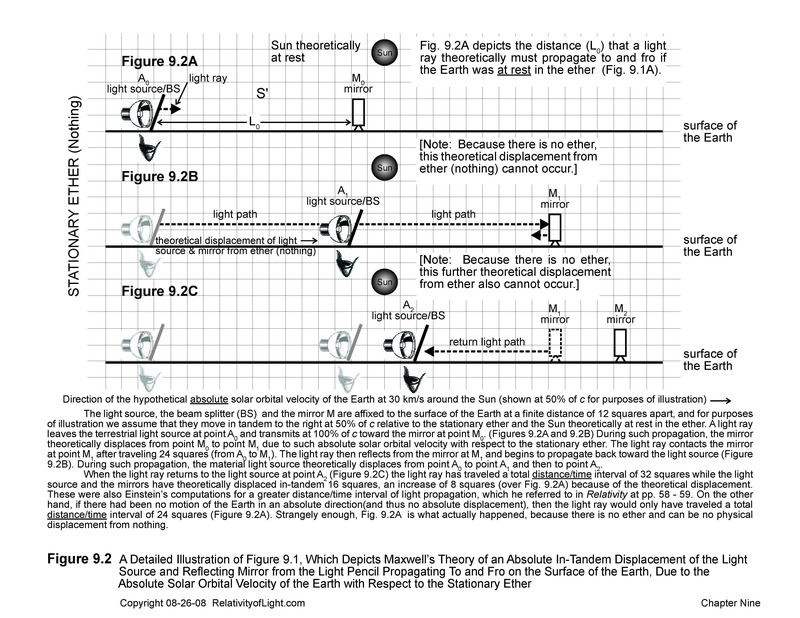 In fact, Maxwell’s 1865 theories of the velocity of light directly contradict Einstein’s theories of relativity. Einstein’s invalid attempts to lend credence to his own relativistic theories, by associating the iconic name of Maxwell with them and invoking Maxwell’s electromagnetic theories as support and confirmation, were (to be charitable) misleading and empirically invalid. Einstein’s contraction and time dilation explanation of Michelson’s and Morley’s paradoxical null result has been repeatedly cited as a confirmation of his Special Theory. The failure of any other rational explanation for the M & M paradox is probably the major reason why the contraction of Special Relativity was accepted by default. In his book, “Relativity,” Einstein asserted that Lorentz’s and Fitzgerald’s aether theories, vis., that the motion of a moving body through the ether produces a contraction of such body in the direction of motion, was the right solution for the paradoxical M & M null result. Einstein then claimed that his interpretation of their theories was “incomparably more satisfactory.” According to Einstein, it was not the motion of a body relative to the non-existent ether which produced the contraction, but rather it was the relative “motion with respect to the body of reference chosen in the particular case” which caused the contraction. On the contrary, as we have previously discussed, all of the basic assumptions for the M & M experiment, and all of the contraction hypotheses invented to explain its puzzling null result (including Einstein’s), are invalid absolute concepts (Chapters 9 and 15). The real explanations for the M & M null result are described in detail in Chapters 10, 11 and especially 12 of this treatise, and more recently in The Michelson-Morley Paradox Solved. They have nothing to do with any contraction, or the dilation (slowing down) of time at a distance. Unlike the above ad hoc contraction hypotheses, such real explanations are supported by empirical evidence, experience, experimental results, common sense and logic. Thus, neither the contraction hypothesis of Einstein nor of Lorentz-Fitzgerald can empirically explain the M & M paradox. Conversely, the M & M null result (the subject of the attempted explanation) cannot be cited as confirmation of its spurious attempted explanation, vis. Special Relativity. Circular reasoning is never very persuasive. Closely related to the M & M experiment is another attempted spurious confirmation of Special Relativity…Einstein’s moving light clock thought experiment. Einstein’s “moving light clock experiment” is essentially nothing more than a graphic illustration of M & M’s false assumptions and Lorentz’s ad hoc relativistic contraction explanation for the M & M null result couched in Einstein’s vernacular (Chapters 27 and 28). It graphically illustrates Michelson’s false assumptions, inter alia, that light must propagate farther in the direction of motion and that the transverse light pencil in Michelson’s apparatus moved inertially and horizontally at an angle relative to the light source and the mirrors (Figures 9.1B, 9.2, 9.5 and 10.1). Thus, Einstein’s moving light clock thought experiment attempts to assert that Einstein’s contraction theory and Special Theory must be the right solution for the M & M paradox. On the other hand, in Chapter 12 and in the Michelson-Morley Paradox Solved we demonstrated the real reasons for the M & M paradox and its null result. Therefore, Einstein’s moving light clock experiment is not a confirmation of his Special Theory. Nevertheless, because Einstein’s moving light clock thought experiment is so often cited as a confirmation of Special Relativity, we will examine and falsify it in detail in Appendix A to the treatise. In 1932, Kennedy and Thorndike performed an experiment that was very similar to the M & M experiment, but with two significant differences. 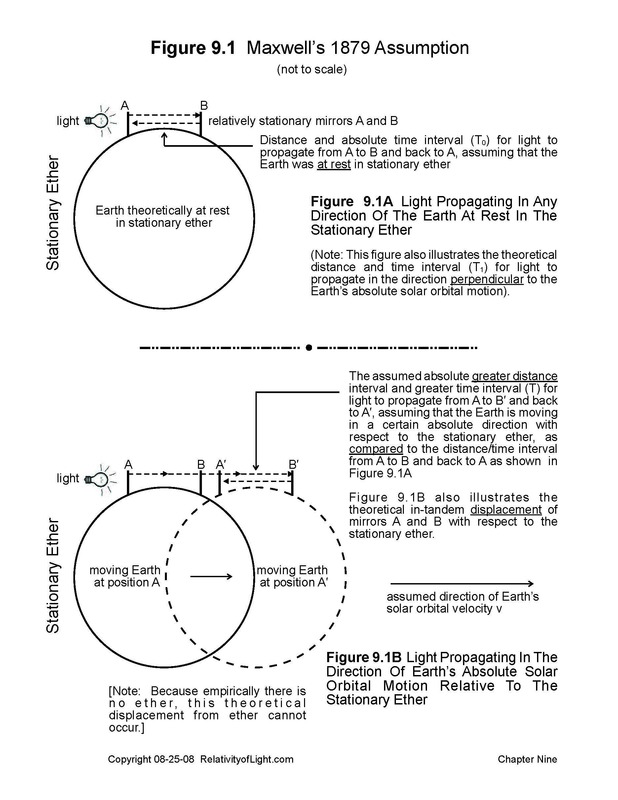 One arm of the apparatus was intentionally made 16 cm shorter than the other, and the apparatus was never rotated over a period of many months while the direction of the Earth’s solar orbital motion constantly changed. No fringe shifts were ever observed. Kennedy-Thorndike accomplished physically that which Fitzgerald, Lorentz, and Einstein were attempting to accomplish theoretically: the contraction or shortening of one arm of the apparatus in the direction of the Earth’s solar orbital motion. Yet the outcome was the same as that of the M & M experiment: a null result. French acknowledged that “the contraction hypothesis…would not explain the Kennedy-Thorndike experiment.” In fact, the Kennedy-Thorndike null result could be considered as experimental evidence that Fitzgerald’s, Lorentz’s and Einstein’s contraction theories are invalid (The Michelson-Morley Paradox Solved, Section 6). Nevertheless, for some unfathomable reason, the Kennedy-Thorndike experiment (and repetitions thereof) is often cited as experimental support for, and confirmation of, Special Relativity. In 1903, Tranton and Noble conducted an experiment where a capacitor was expected to turn as the Earth progressed along its solar orbital motion. “The capacitor was expected to turn in order to maintain its plane perpendicular to the direction of the earth’s motion through the ether.” But Tranton and Noble observed no turning (nor even any expected oscillations) and concluded that the result was purely negative. Lorentz concluded that the null result of this experiment “could be explained the same way as the Michelson-Morley experiment, vis. by his contraction hypothesis.” For this reason, the null result in Tranton and Noble’s experiment is sometimes incorrectly cited as an experimental confirmation of Special Relativity. In 1902, “Lord Rayleigh…sought to detect whether an isotropic substance at rest on the moving earth exhibited double refraction owing to the strain originating in Lorentz’s proposed hypothesis of contraction.” Rayleigh found no double refraction. In 1904, American physicist D. B. Brace repeated Rayleigh’s experiment and found the same result. Both of these experiments are sometimes cited as experimental support for Special Relativity. Why? Because they involve Lorentz’s hypothesis of contraction, because they were cited by Lorentz as a reason for his April 1904 theory, and because Einstein “borrowed” the lion’s share of Lorentz’s April 1904 contraction theory for his own 1905 Special Theory. In Chapter 13 of his book, Relativity, Einstein claimed in great detail that Fizeau’s 1851 experiment “most elegantly confirmed” his Special Theory. He also claimed that Zeeman’s similar 1914 experiment confirmed his theory. Fizeau’s 1851 experiment is also cited as a confirmation of Special Relativity by many other scientists. But in Chapter 29C of this treatise we demonstrated how and why Fizeau’s 1815 experiment does not confirm Special Relativity. In Chapter 7 we also described a quantum physical process which should explain Fizeau’s paradoxical results. Therefore, neither Fizeau’s nor Zeeman’s experiments, nor any other similar aether “drag” experiments are an experimental confirmation of Einstein’s Special Theory. It is frequently claimed that Einstein’s relativistic concept of the “variation of mass with velocity” is a confirmation of Einstein’s Special Theory. However, in Chapter 17 we demonstrated that Einstein’s equation for such variation (increase) was not correct. In Chapter 17 we also described the real reason for any such increase in mass—the application of energy to matter in order to increase its speed—and the fact that a body’s mass does not increase with relative velocity as claimed by Einstein. Merely describing the abstract generality of a result (increase in electromagnetic mass, a resistance, with increase in velocity) which was previously demonstrated by others (vis., Kaufmann and Abraham) is not a confirmation of Einstein’s relativistic concepts of Special Relativity nor of the Lorentz transformations; especially when there is almost no correlation between Einstein’s equations, or their theoretical magnitudes, and the empirical results. The experimental equivalence of mass and energy is often claimed to be a confirmation of Special Relativity. However, as explained in Chapters 31 and 32 this equivalence is the result of a physical process which has nothing to do with the contraction of matter, time dilation or the Lorentz transformations. It is a completely separate phenomenon which was discovered by others long before Einstein wrote his September 1905 paper on energy (Chapter 32). For these reasons, it is not a confirmation of Einstein’s Special Theory. The relativists claim that Einstein’s postulate, the “speed of light is independent of the velocity of the source,” is a confirmation of Special Relativity, and they cite numerous experiments from 1913 to 1977. It is true that Einstein cited De Sitter’s 1913 binary star observations and conclusions as authority for such postulate. Zhang cites many experiments which are consistent with De Sitter’s conclusions. The Michelson & Morley experiment and the aberration of starlight have also been cited by the author as confirmation of De Sitter’s conclusions. But the fact that Einstein postulated De Sitter’s conclusion, and the fact that such conclusion is most likely true, does not confirm Einstein’s bizarre concepts of Special Relativity or any mathematical consequences of the Lorentz transformation. The relativists claim that experiments which demonstrate the “constancy or isotropy of the two way speed of light” are confirmations of Special Relativity. They even cite the null result of the M & M experiment as authority for this proposition. However, the fact that light has a constant transmission speed of c in vacuo in all directions of space, does not confirm Einstein’s assertions concerning the absolute propagation of light at c (Chapter 21), nor his concepts of time dilation or the contraction of matter, nor any mathematical consequences of the Lorentz transformations. The relativists also claim that the “isotropy of space” is a confirmation of Special Relativity and cite several experiments which confirm such isotropy. However, the concept of the isotropy of space is nothing new. It can even be found in Newton’s concepts of absolute space and infinite space. The fact that empty space is the same in all directions and that Einstein postulated this conclusion, does not tend to confirm his radical concepts of Special Relativity, noror any mathematical consequences of the Lorentz transformation. The only reason why light is constant when it propagates through any medium (including a vacuum) is again inherent in Maxwell’s 1865 theory. If the medium does not change (i.e. it is isotropic), then neither does the velocity of light through it (Section A of this chapter). This conclusion is inherent in Maxwell’s 1865 theory that the only thing that determines the velocity of light in a particular medium (including a vacuum) is the material density of that medium itself. The velocity of the material source of the light is irrelevant to the velocity of the light through a particular medium (Section A of this chapter). have built-in mathematical relationships between the velocity of matter and the speed of light, and they may assist scientists to reach a better understanding of high velocity fundamental particles. But such application is not a unification between quantum mechanics and the empirically invalid concepts of Special Relativity, nor is it an experimental confirmation of Einstein’s Special theory. It has been claimed that the concepts of Special Relativity are mathematically consistent and that this is a confirmation of their validity. The concepts of aether were also mathematically consistent, but the fundamental assumptions upon which the concept of ether was created were empirically invalid. Aether was a scientific myth; it did not exist. The same is true of Special Relativity. An empirically invalid theory may be internally mathematically consistent, but this does not enhance the validity of its false premises. In 1907 and 1908, Einstein’s former mathematics professor, Hermann Minkowski, devised a new four-dimensional system of geometry for the specific purpose of illustrating Einstein’s Special Theory, its relativistic concepts and its algebraic equations. It became known as “space-time geometry.” Spacetime geometry incorporated all of the concepts of Special Relativity, including the Lorentz transformation equations. Can it be any wonder that spacetime geometry has apparently accomplished its stated purpose? For example, using spacetime geometry, Born illustrated Einstein’s concepts of simultaneity, the Lorentz transformation, the Lorentz contraction, time dilation, Einstein’s clock paradox, “proper time”, “time like” and “space like” distance, and many other relativistic concepts. And so have many other relativists. But none of these mathematical concepts have any empirical validity. Spacetime geometry is therefore totally consistent with Einstein’s Special Theory, and it provided the framework for Einstein to construct his General Theory of Relativity using curved Spacetime. But Minkowski’s geometry is only as valid as Einstein’s Special Theory concepts from which it was created and which it illustrates. But Special Relativity is based on a monumental false premise, and it is empirically invalid. For these reasons, the mathematical concepts of four-dimensional spacetime geometry and its spacetime illustrations are not themselves confirmations of Special or General Relativity. Circular reasoning again. Einstein and his followers have cited empirical phenomena which are coincidentally or approximately somewhat similar to a relativistic prediction, such as the increase in the mass of a moving body with applied energy or approximate the similarity between Einstein’s and Fizeau’s equations. They characterize them as experimental confirmations of Special Relativity. They have incorrectly characterized accepted theories, such as Hertz’s equations, as supporting Special Relativity. 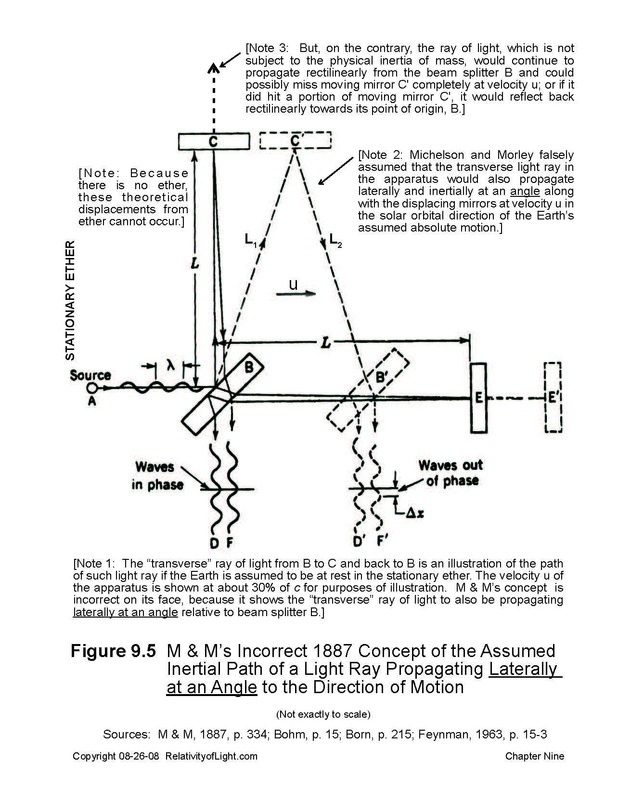 They have claimed as confirmations numerous experiments where the paradoxical results have not easily or adequately been explainable by current knowledge, such as the 1851 Fizeau Experiment, the 1887 M & M Experiment, and the Tranton-Noble experiment. They have then suggested mathematical consequences of the Lorentz transformation which appear to have some correlation to mysterious phenomena or experiments, and then have asserted that such mathematical consequences and paradoxical phenomena are confirmations of Special Relativity or one of its concepts. They have even cited the basic assumptions and theoretical consequences of the Special Theory as its own confirmation…such as Einstein’s two fundamental postulates (Zhang, pp. 135 – 174), and the theoretical contraction of the M & M longitudinal arm. All of these claims are designed to give Einstein’s Special Theory and the Lorentz transformation an aura of mathematical or magical legitimacy. Such claims are also designed to place the burden on the shoulders of the theory’s skeptics and detractors to prove that such so-called confirmations are incorrect. But the scientific method does not work that way. It is the responsibility of the creator of a theory or process to demonstrate its correctness and the validity of its applications to a high degree, by logic, experiment, observation, and other empirical scientific means. If a so-called confirmation is demonstrated to be only conjecture, a coincidence, circular reasoning, only an approximation, misleading, or otherwise unreliable or invalid, the relativists must acknowledge this fact. All of these procedures are what is required in space exploration and by the pharmaceutical companies with regard their new medical discoveries. A similar standard should be applicable to theoretical physics. Otherwise, we will not be able to tell the snake oil promotions from the legitimate cures. It has been repeatedly demonstrated by the author that many so-called confirmations of Special Relativity are nothing of the kind. This should be a red flag to every reader to be highly skeptical of other so-called confirmations, of which there are many. There is neither time nor space in this treatise to analyze and disprove, one by one, every relativistic claim by Einstein and his disciples, and the reader should not accept them on face value. In the next chapter we shall discuss the major claimed confirmations for Time Dilation, and why none of them are valid.